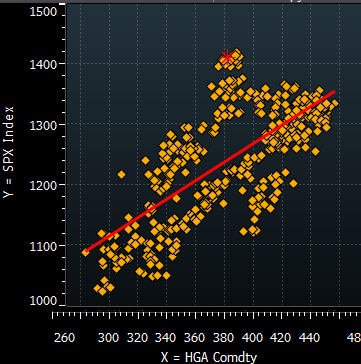 A quick look at the two-year scatter plot of the SP500 index and copper futures (HGA) prices shows a possible dislocation. Is the equity market overpriced relative to copper? Recent data shows copper outperforming equities in 2010 (unfortunately HGA data doesn't exist for an earlier period), as QE2 driven cyclical assets were bid up on emerging markets/China growth story. Since the spike in the Eurozone crisis, copper underperformed into this year. 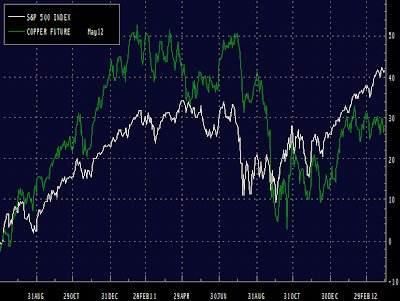 One explanation for this divergence is the lowered set of expectations for emerging markets (EMG) growth. With China, Brazil, and particularly India growth expected to moderate (or possibly worse), copper continues to lag. 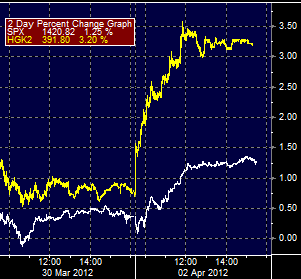 The effect is quite pronounced today as the perceived positive news from China lifted copper futures relative to SP500. Year-to-date however copper still lags the SP500 by some 10%. Going forward copper's performance relative to the US equity market provide a good indicator of EMG growth expectations. Note: if anyone is interested in doing a longer-term comparison using LME forwards instead of HGA, please email us.